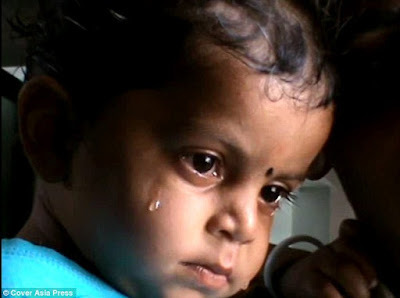 This is the tragic moment a crying toddler desperately tries to drink his mother’s milk, unaware that she is dead. Police were called to reports of a dead body near train tracks in Damoh district, Madhya Pradesh, India, this morning. 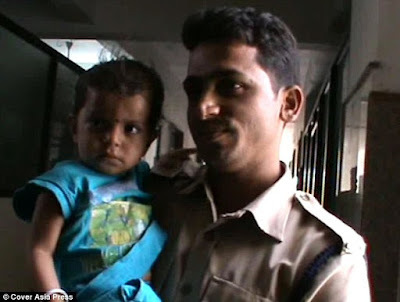 Officer Nand Ram, who is the head constable of the Government Railway Police, said: ‘The toddler was crying for his mother and on receiving no response from her; he held her and started drinking milk from her. ‘We were shocked to see it, it was very sad. The woman was lying dead while the child was sitting next to her scratchless. ‘This was something we have never seen before. It was quite emotional for us all. Mr Balmiki added that the had been sent for a post-mortem and an investigation is underway to determine the cause of death. The toddler was taken to a nearby hospital for a check-up and the local Child Welfare Committee was informed.